NEW YORK -- To many in New York City, the rats are winning. The city's complaint hotline is on pace for a record year of rat calls, exceeding the more than 24,000 over each of the last two years. Blistering audits have faulted efforts to fight what one official called a "rat crisis." And even jaded New Yorkers were both disgusted and a little impressed by "Pizza Rat," the plucky rodent in a recent viral YouTube clip seen dragging a large cheese slice down a subway stairwell. Nora Prentice, who lives on Manhattan's Upper West Side, has repeatedly complained to the city about a colony of about 200 rats in a neighborhood park. "It's like the Burning Man of rats," she said. "They're just sitting there in a lawn chair waiting for you. . I don't know what the city can do about this rat condominium. It's really gross." Prentice said that she avoids the area because of the rats and that complaints she filed with the city were closed after officials told her they were "working on the problem." "It means you can't lay down and relax in that park," she said. "What kind of an answer is this?" Such gripes have found an advocate in Comptroller Scott Stringer, the city's top financial officer, who has taken on the self-appointed role of rat czar. In separate audits over the past two years, he has criticized the city's health department for not responding quickly enough to rat complaints, and the Metropolitan Transportation Authority, which runs the subways, for not cleaning stations more regularly. Such breakdowns, he says, have allowed rats to thrive. "I've seen rats walking upright, saying, 'Good morning, Mr. Comptroller," he said. "It's unsightly to see rats running through neighborhoods like they actually bought a co-op somewhere." New York officials who have been fighting the battle for decades say rising complaint numbers don't mean there are more rats, and they argue the rat population has actually been holding steady the past few years. A Columbia University doctoral student using statistical analysis last year estimated the number of rats in the city at 2 million, claiming to debunk a popular theory that there is one rat for each of the city's 8.4 million people. But scientists and city officials say it's impossible to accurately estimate the number. "There's no way to do that," said Caroline Bragdon, a city's health department scientist and resident rat expert. Scientists can estimate the number of rats in a fixed area, like a park, by counting burrows and multiplying it by 10, but larger estimates are just not accurate, she said. The spike in complaints of rat sightings and conditions attracting rodents is probably because garbage was left festering on sidewalks during last winter's large snowfalls, and registering complaints is easier now with the city's 311 complaint line smartphone app, Bragdon said. Bragdon's team responds to such complaints, compiles a citywide "rat index" and inspects dozens of buildings each month. What started as a team of less than a dozen has now expanded to nearly 50 people, working with a nearly $3 million annual budget to implement the latest push to control rodents. Mayor Bill de Blasio's new "rat reservoir" plan targets communities with the highest number of rat complaints and seeks to dismantle habitats and food sources. That effort includes setting traps, installing rodent-resistant trash cans and working on legislation that would require restaurants to hose away sludge from dripping garbage. Every little bit helps, Bragdon said. Unlike the voracious Pizza Rat, she says, most rats need only an about an ounce of food and water daily to survive. "It's an apple core, it's a piece of a hotdog, a couple of chips. It's the crumbs," she said. "You'd much rather prevent rats from being here than treat them with poison after they're here." But not all new techniques have worked out. State Comptroller Thomas DiNapoli released an audit finding little tangible success from a pilot program by the MTA to rid the subways of rats by removing trash cans from some stations, forcing riders to go above ground to throw away their garbage. The audit said the MTA had mostly selected stations with low rodent sightings to begin with, so it was hard to gauge any reduction. "There are a lot of rats, especially at night," subway rider Yessenia Alvarez said as she waited on a platform in Harlem. "When they come out, it's like they're everywhere." City health inspectors regularly scour the city, poking into sewer grates and crawling under park foliage, searching for the signs many would never notice: tiny mounds of dirt that lead to an underground rat burrow, streaks in walls about an inch off the ground left by greasy fur, or tiny holes the critters can crawl through. 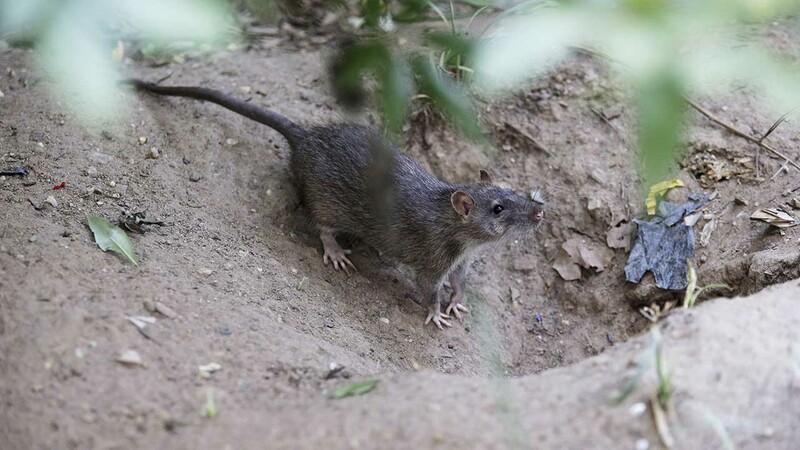 "Here's a big burrow, and it's fresh," Bragdon said during a recent inspection of a small park in Manhattan's Chinatown neighborhood, notorious for its rat problem. As she pointed to the hole, a furry little head popped out, revealing one of the newest generation of New York City rats. Bragdon greeted it: "Hi, mister."